"Weightless" - Hot off the Press! Have you seen Weightless? It's hot off the press and authored by Kate Wicker, sister friend to many, known at her blog as, "Wife, Mom of Littles, Journalist, & Expert in Hazardous Waste Removal," and she wears another hat too, as senior writer at Faith & Family magazine. DONNA-MARIE: Kate, your book looks so intriguing. We both know that it's no secret that we live in a culture which can seem to dictate to women how they should look, dress, and feel. May I ask what prompted you to write this book? Is there something beyond the unrelenting pressures from our culture which prodded you to speak up about this important topic? KATE: First off, thank you, Donna, for inviting me to share a little about my book, Weightless: Making Peace With Your Body, with your loyal readers. One of the main reasons I felt called to write a book of this nature is because I personally struggled with a clinical eating disorder, and body angst has unfortunately been a stubborn companion throughout different periods of my life. When I was younger, I was on the chubby side and endured some pretty cruel teasing. One of my nicknames was Miss Piggy. I started thinking there was something wrong with me from a young age. Later I naturally thinned out due to puberty, but my weight quickly became a barometer of my self-worth. It was also something I could control. Thus, in high school I fell prey to an eating disorder. By my senior year, I thought I had it under control after a brief stint meeting with a nutritionist; however, I had a bad relapse in college. Thanks to a multidisciplinary approach to my healing that included therapy, nutrition counseling, medical care, etc., I was eventually able to put an end to the destructive physical habits; however, I still had a long way to go to rewrite some of the internal scripts that told me I wasn’t good enough unless I weighed a certain amount or looked a certain way. My Catholic faith proved to be the most powerful healer of all, and I believe any woman who has struggled with her body image or perhaps struggles with putting food in its proper place can begin to reclaim the beauty of Creation with the help of the teachings and wisdom of the Church. During my recovery process, I voraciously read every book I could get my hands on that dealt with overcoming eating disorder and/or body image problems. I discovered a lot of helpful information out there, but there were very few resources that mentioned God. I’d seen Christian dieting programs, but I wasn’t looking for another diet program - whether it was healthy and balanced or not. I craved a book that would look at things like beauty, body image, our relationship with food, etc. through the lens of Christianity. No one else was writing one, so I wondered if perhaps I should try. With God’s grace and the support of many friends, an acquisitions editor who believed in me and my writing, and loved ones, Weightless came into being. I should add that being the mom of three daughters (possibly four; we’re due with our fourth any day now, but we don’t know the gender) has made me even more passionate about debunking so many of the myths perpetuated by our beauty and food-obsessed culture. I want my own children to know that their true value lies not in the reflection they see in the mirror or the number on the scale but in their passions, their intelligence, their virtues, and most importantly, their souls. DONNA-MARIE: I haven't read Weightless yet, but it looks extremely interesting and very valuable to many women today. Can you tell me what you think your book can do to help women? KATE: I’m hoping Weightless might minister to at least a few women out there. It’s not a dieting book. Nor is it just for women who have suffered from clinical eating disorders. It’s for any woman who hasn’t always liked what she sees in the mirror. It’s for women struggling to find a balance in being healthy and becoming obsessed with what they eat and how much they exercise. It’s for women who are perpetually on a diet and have started seeing food as “good” or “bad” instead of simply as fuel for their bodies. It’s for women who feel a whole lot younger than they look and are pining for the Fountain of Youth. It’s for moms who want to raise daughters to have a positive body image and a healthy relationship with food. It’s for anyone who wants to fight the messages culture sends us that if want to be happier, then we should look this way or eat this and not eat that or wear this. I pray the Holy Spirit gifted me with some of the right words that Weightless might touch women from all walks of life and speak not only to those who may have faced an eating disorder, but also to anyone who wants to live an abundant life, unencumbered by society's obsession with thinness, physical beauty, youth, or food. Some of the topics covered include applying temperance as related to food, aging, an exploration of how motherhood changes the way women see their bodies, raising healthy daughters, and the media’s influence on body image compared to what our faith teaches us about our appearance and our bodies. 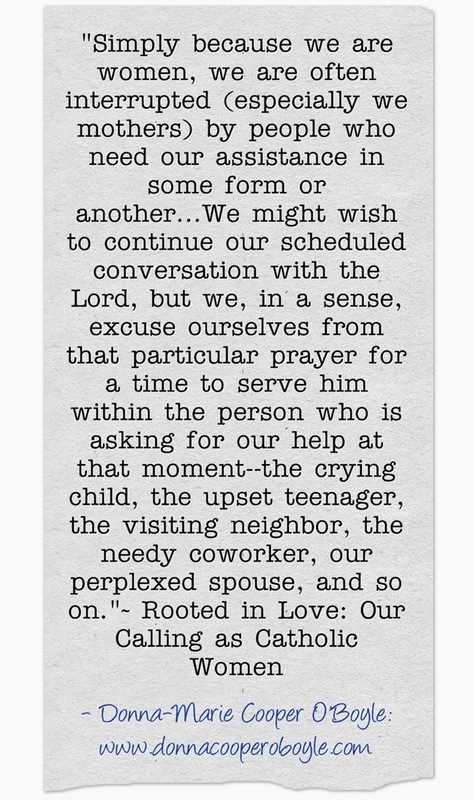 There’s a “Soul Food” section as well that provides readers with inspiring quotes from Scripture and the saints, and spiritual and practical tips that serve to encourage and edify readers. Each chapter concludes with a meditation and prayer. Jennifer Fulwiler of Conversion Diary wrote its foreword. DONNA-MARIE: Where can we get your book, Kate? 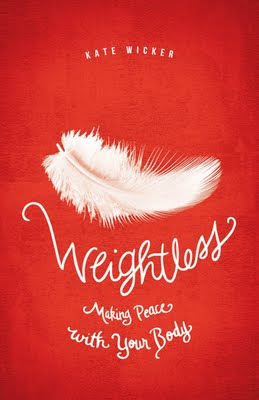 KATE: Weightless: Making Peace with Your Body is available from Servant Books, Amazon, Barnes & Noble, Borders, ChristianBook.com, and other retailers. Weightless is also available on Kindle. A Nook version may be available by the end of 2011. If someone is interested in having the book signed with a personal note or dedication, I’m also selling copies directly through my website: KateWicker.com. Do you have any plans for book signings or presentations we can look forward to in the near future? Well, as I mentioned we’re waiting in joyful anticipation for the birth of our fourth baby, and this “work in progress” is the most important one right now. I do hope to participate in some speaking engagements and book signings down the road. Those interested in learning more about any upcoming events can stop by my blog - KateWicker.com - and click on the Weightless tab at the top for more information. Thanks again for allowing me to share my story and information about my book. I’ll end with a quote from Saint Gianna Molla, the patron saint for mothers, doctors, and unborn children, that a friend recently passed along to me. It’s a wonderful reminder that our purpose here on this earth is not to fit into some subjective ideal standard of beauty but to reveal God’s love to others. Let us respect and honor these temples of ours, and allow God to shine through them! Blessings! "Our body is a cenacle, a monstrance; through its crystal the world should see God." DONNA-MARIE: Thank you very much, Kate. I am sure that your book will minister to more than "a few women out there!" Our world really needs this book. I pray it does a lot of good. And I can't wait to hear the news about your new precious baby who will soon grace the Wicker household! God bless you and yours, Kate! Summer is here for sure! "She might have been ugly by today's glamour standards. I don't really know, and there isn't a photograph of her because the camera had yet to be invented. She makes me think of people whom I know who have lived with some sort of disfigurement or scarring on their face. There is an acute form of social suffering attached to that. We can all call-to-mind the face of someone who is or was derided for being socially awkward, or worse, rejected. Today is the the feast of St. Benedict. Let's pray for his intercession. St. Benedict was born in the year 480 at Nursia in southern Italy, to a noble Roman family. Subiaco, near Rome. There he was taught the Christian ascetical life by St. Romanus. Monte Cassino, where he founded the great abbey that became a center of the religious life in Europe. when he needed it. Benedict foretold the day of his death and was then seized with a violent fever. Cross and the merits of St. Benedict. evil is comforting to me as I invoke your assistance. Did you hear about the Catholic Writers to Convene at the August Conference in Valley Forge? I have attended and spoken at the conference the past two years as well as have participated on their panels. I'll be there again this year as well, with bells on my toes. :) It's a great conference to attend. Try to make your plans now to attend and catch all of the wonderful talks and presentations. In addition, you will see many Catholic exhibits and publisher's booths, and have a chance to chat with like-minded people. Masses are available, Eucharistic Adoration, Confession, and more. August 3-5, 2011, at the Scanticon Hotel Valley Forge in King of Prussia, PA. Sponsored by the Catholic Writer’s Guild (CWG) and the Catholic Marketing Network (CMN), it will be held in conjunction with CMN’s annual retailer trade show. The Catholic Writers Conference LIVE provides Catholic authors with a prime opportunity to meet and share their faith with editors, publishers, fellow writers, and bookstore owners from across the globe. • One-on-one coaching sessions. For $35 an author can have a 30 minute private consultation with a specialist who will review their manuscript and guide them toward publication. • Rapid-fire readings. Published authors will each have five minutes to read a selection from one of their books. A mass book sale and signing will follow. Lewis says the conference comes at a modest cost. “Registration for the jam packed three days is only $90 for CWG members or $100 for non-members. And we have a special price of $42 for students. 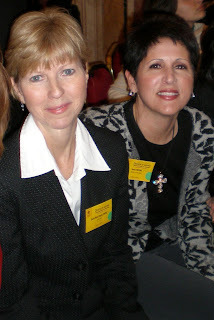 Our conference allows you to connect personally with Catholic publishers and retailers, to show your work, learn the craft and network.” Priests and religious are invited free of charge, but must register at the email address: http://www.catholicwritersconference.com/ . 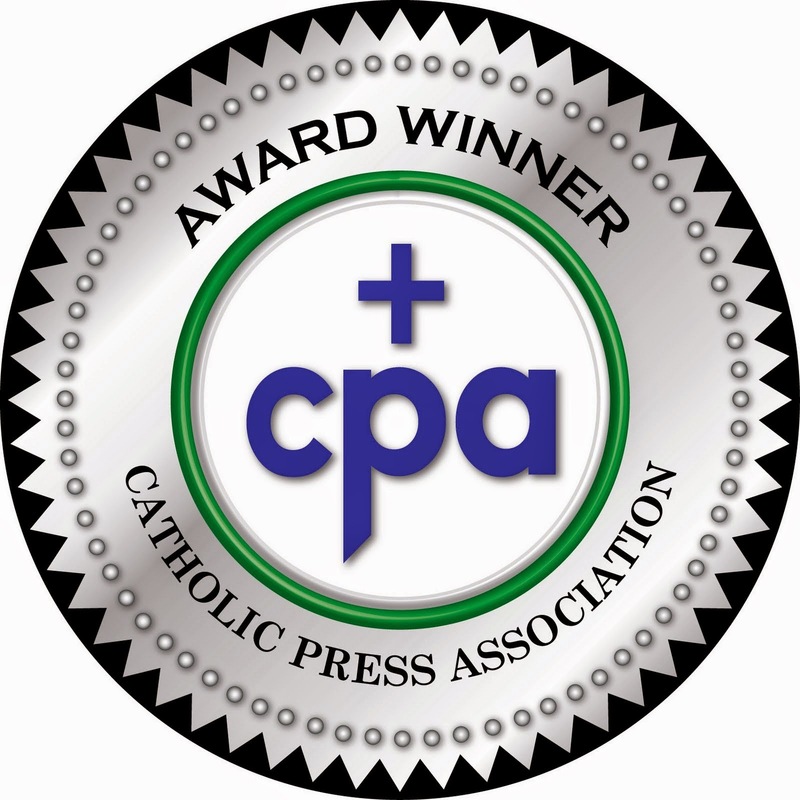 Also at this year’s conference, the CWG will be presenting its first ever Catholic Arts and Letters Awards (called the “Lilies”) for the best in Catholic fiction. This award will recognize one book in the adult market and one in the children’s market for its literary merit. The CWG is a professional group of writers, artists, editors, illustrators, and allies whose mission is to build a vibrant Catholic literary culture. The organization is loyal to the teaching authority of the Roman Catholic Church. 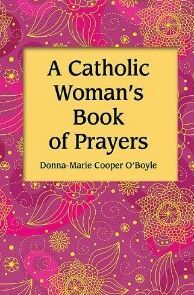 "I've been slowly reading through Donna Marie Cooper-O'Boyle's latest book, A Catholic Woman's Book of Prayers, and will say it is a gem on many levels. The introduction revealed something Archbishop Fulton Sheen said about women that previously, I did not know. Which stands up better in a crisis -- a man or a woman? The best way to arrive at a conclusion is to go to the greatest crisis the world ever faced, namely, the Crucifixion of our Divine Lord. When we come to this great drama of Calvary, there is one fact that stands out very clearly: men failed... On the other hand, there is not a single instance of a woman's failing Jesus. Archbishop Sheen was referring to a very specific time in history because we all know there have been many women since that point who yes, have failed Jesus. But during our Lord's most trying time, the women were there. It gave me great encouragement to read those words. 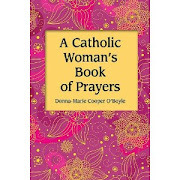 The rest of the book is comprised of prayers for single women and married women, briefly covering how each is a vocation. The chapters of the book are divided into such topics as: The Joys of Womanhood, Challenges Women Face, The Mission of Women, and Mary, A Model for Women. The Mission of Women is one that I think is needed more than ever by the Church and our culture. Sometimes a mother may not realize how influential her mission is as she cares for her children on a daily basis. Yet what could be more important than raising children to be faithful and obedient to God? When such children grow to become adults. the lessons and discipline of a mother reaps great rewards as that son and daughter go out into the world and influence others. lies the call to my distinct mission from God. and help my neighbor find his way to heaven. There are so many hurting and confused people in our midst. As women, we have a special grace to speak words of kindness to them. This to me, is one of the most beautiful things about being a a woman. God has allowed us to be vessels by which He pours His love into so that we can then pour it into the world. There are songs and poems written about "a woman's touch." I believe it is God's call to every woman to discover that her unique "touch" is and then minister that in her own life. The book is small, and can easily be slipped into a purse or even a pocket. 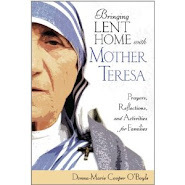 The thick, semi-glossy pages are decorated with flowers and the text is a combination of prayers, beautiful quotes from such saints as Blessed Teresa of Calcutta, St. Teresa of Avila, and St. Ambrose. It is a perfect gift for any woman in your life and will bring great encouragement to her. 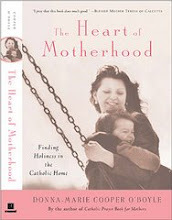 To learn more, go to Donna Marie's website, (http://www.donnacooperoboyle.com/) where you can order the book. Ladies, keep praying. Our world needs it!" Thank you very much for your kind review, Mary Rose. God bless you! 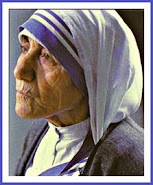 many new scans of letters Mother Teresa sent me! 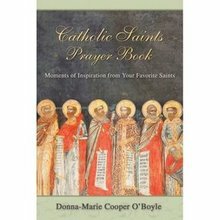 It will be also be available for pre-order on my website very soon: http://www.donnacooperoboyle.com/ . There you'll be able to order autographed copies. I'm sure that OSV will also be selling it from their website soon as well. Part Two of "On my way to EWTN"
And now to continue with my story...As the woman put the blessed Miraculous medal on her necklace she told me, "Oh! You have no idea how much this means to me!" After telling me that she was a Methodist (and still welcoming the blessed medal), she said that about a month and a half earlier something very scary and profound had happened to her. She was in her kitchen in Alabama on what would seem like an ordinary morning, making her sandwich to bring to work for lunch. Her two housemates had just left for work and she would be leaving soon. This was at the time of the fierce and awful killer tornadoes that were ruthlessly hitting that area. The sirens were wailing and Nancy was listening intently to the radio in between the roars of wind to know what she should do with regards to the storms. The wind seemed to be knocking fiercely at her door for she heard some thudding sounds right near her at the back door of the kitchen. Before she could react in any way, the door came crashing in! What she did not expect to see was the hoodlum who had broken down her door. He grabbed her and started to pound on her head. After what seemed like an eternity of brutal pounding to her head, the intruder told her to head for the bedroom. He pushed her small frame towards her bedroom. Nancy cried out from the depths of her heart, "JESUS! In the name of Jesus, LEAVE!" Over and over again, she cried out her mantra. Suddenly, an idea struck her. "I have jewelry!" she shouted. "Where?" he wanted to know. She showed him her jewelry box in her room. As he reached for it, she managed to escape and ran all the way to her neighbors house, pounding on the door to get in. She told them hat happened and her neighbor grabbed his shot gun and fired away a few shots towards the robber who was now running away with her jewelry box. Nancy didn't care if he got away with her things, she was just so relieved that she was able to escape and that God had spared her further harm. The gun shots startled the man and he dropped the jewelry box and fled. So, Nancy never lost her jewelry which was a bonus. As Nancy told me the story, she put her hand to her heart and softly let the words come out, seeming to be feeling it all over again. I told her that she need not recount such a frightening and painful experience. But, she told me that it was okay. She wanted to. She said she was doing well and it was okay to talk about it. Nancy showed me the scar on her forehead and pointed to the back of her head where she had had numerous staple sutures. She explained that the experience somehow miraculously brought her even closer to God. She said she had been searching and praying more prior to that incident. She carefully pulled out her Bible that was in the pocket of the seat in front of her and let it set on her lap as she spoke to me. She said she forgave the man for what he did and it was hard for her family to understand how she could. After expressing my sorrow to her that she had to go through that awful beating and frightul experience, I told her that I was so thankful to God that she was okay now and that God was blessing her, (more than she could imagine) and that we had met and could talk and share our Faith. I said I just love how God sets these encounters up and that I give all glory to Him. She agreed. I shared with her that I pray when I travel and ask the good Lord to place me where He wants me to be and use me for His glory. She told me that she wants to start praying about her seating now. And I told her, that even if we don't ask Him, we need not worry, He'll do it anyway! He's in control. Our beautiful conversation continued and we were so very thankful to God for His mysterious ways and His great love for us all. We decided to have our photo taken on my IPhone after we got out of the plane. We'd find someone there at the airport to snap it. We exchanged contact information and parted with a big hug. God is so very good to us! I hope I hear from Nancy again. If not, that's okay, she'll remain in my heart and in my prayers. And, by the way, she gave me permission to retell the story on my blog. who will be serving in prison for a long time. Recently I traveled to Birmingham, Alabama to go to the EWTN network where I would tape 25 new segments of my show: "Everyday Blessings for Catholic Moms." I'd also be doing an interview with Doug Keck on his Bookmark show and meet with a few people to discuss a few things. I had finished up a book I was writing before my deadline to prepare for the trip and the shows. All in God' timing. On my way down there I sat next to a young woman on the plane who was busy reading her magazine. 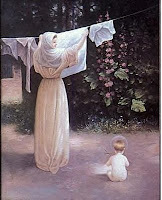 I quietly prayed my Rosary upon tale-off and sat quietly saying my prayers as we traveled. Since my neighbor in the seat beside me was occupied with her magazine reading I thought it was best not to disturb her. It would be about a 3 hour flight. I always pray and ask God to use me for His will and to seat me near whomever He wants me to sit while traveling. About halfway into the flight, the pilot announced that we would land about 50 minutes early. Suddenly, the woman beside me turned to me and asked, "Did he say fifteen minutes or fifty?" She couldn't quite believe that it might be fifty. But it was! I confirmed his words and so the ice was broken. We began a conversation. By the grace of God, somehow we got to talking about Faith! Right now I can't remember how that happened. Sometimes I can never quite remember when I look back at some of the amazing encounters that God blesses me with how I ever got to talking about God with a perfect stranger. But, God knows and that's all that matters really. He sets up the opportunities and I praise Him for it. So, the young woman and I had an interesting conversation. And then, I reached into my pocket to retrieve the blessed Miraculous medal I had put in there that morning feeling confident that it may very well find a home around some one's neck (please God!). I took out the medal and as I started to hand it to the woman, I told her that I wanted to give her something that I felt was very special. I proceeded to tell her that it was blessed and that I had placed it on Pope John Paul II's tomb at the Vatican and also on Blessed Mother Teresa's bed at the convent where she stayed when she was in Rome with the Missionary of Charity Sisters. I then kissed it and touched it to the medal I wear that Mother Teresa had given me. I handed it to her. She was so happy to receive it. She said something like, "Oh! You have no idea how much this means to me!" 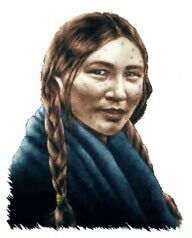 She reached around her neck to take off her chain and then proceeded to put the blessed Miraculous medal on her necklace. I was so happy that she would actually wear it because the Blessed Mother had stated to Saint Catherine Laboure whom she appeared to that those who wear the medal will receive many graces. Specifically, in 1830 after showing St. Catherine Laboure a vision of the image of the medal, Mary said, "Have a medal struck upon this model. 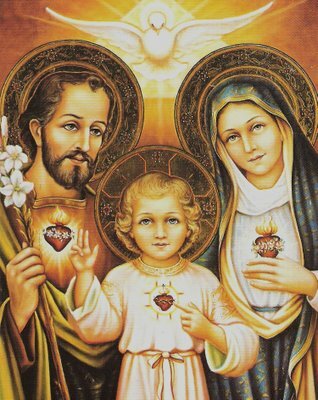 All who wear it, when it is blessed, will receive great graces, especially if they wear it around the neck." Interview with Fr. James Farfaglia Re: His New Book! Have you seen this book yet? Fr. James Fargaglia released his second book recently. 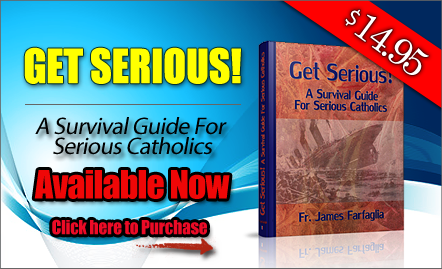 It's titled, Get Serious: A Survival Guide for Serious Catholics. Fr. James's website states the book is: "With endorsements from Spirit Daily’s Michael Brown, Renew America columnist Matt Abbott, Fr. Sam Medley SOLT and TOB Ministries Director Steve Pokorny. 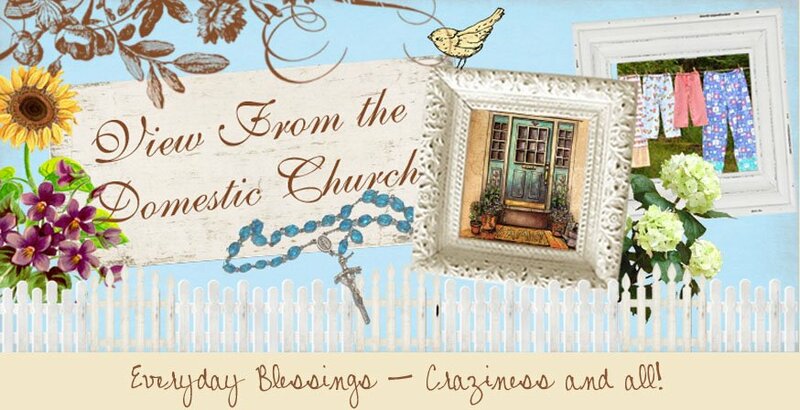 Preface by Donna-Marie Cooper O’Boyle, Catholic wife and mother of five, author, speaker and EWTN TV host of Everyday Blessings for Catholic Moms, Epilogue by Jennifer Hartline, Catholic Online contributing author." 1) Fr. James, what compelled you to write this new book? Fr. James: "For many years I have felt that the laity needed a very clear book on how to develop and live out a serious spiritual life. In the past, many books have been written on the subject and they are all very good, but I thought that something new was needed that addressed the issues of our times." 2) What are your hopes for your readers? Fr. James: "My hope is that people will put into practice what I am teaching in my new book. They will find great happiness by having a personal relationship with God." 3) Can you tell me a little about the feedback you've been receiving from your first book? Fr. James: "The response has been quite amazing. 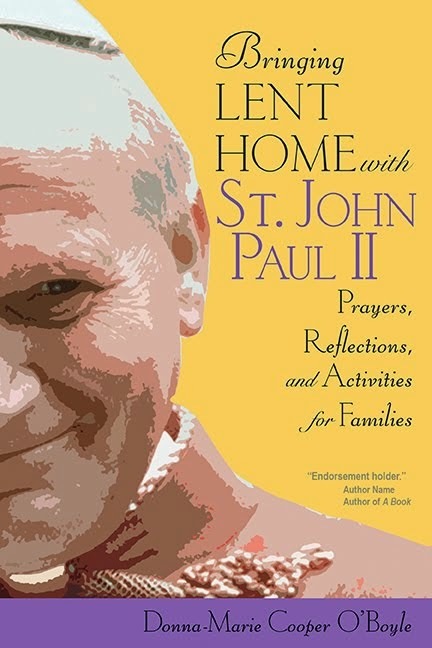 I continue to receive many emails from around the county and even from other countries from people, especially from men, on how my short book has helped them to become better men, better husbands and better Catholics. It is a very beautiful feeling to know that my parish work has extended all over the world. My only desire as a priest is to help as many people get to Heaven. What else is there to do?"